If we are serious about building power and affecting change we must have an electoral strategy, at all levels, building and training our members to run for office. Rights & Democracy staff and leaders will hold daylong trainings this summer and fall and a two-day training early 2018. Fill out this registration form if you’re thinking of running for office or taking a leadership role in supporting electoral campaigns as part of our movement. In 2016, Rights & Democracy engaged in our statewide elections by building a team who vetted over 60 candidates who filled out our candidate questionnaire by setting follow up interviews with those whose values aligned with our organization’s and bringing endorsement recommendations to our leadership committee who voted to endorse a slate of 37 local and statewide candidates (20 of whom won their elections). Our slate of endorsed candidates were supported through staff and volunteer time on doors and phonebanks, event coordination and turnout, social media, and email communication to our thousands of members throughout the state. 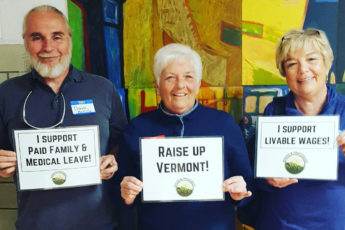 Some of our endorsed candidates were founding members of Rights & Democracy, and others were allies whose values aligned with ours and who we knew would work with us toward passing progressive legislation in the VT statehouse. Since the start of the 2017 session we have been focusing heavily on building and strengthening our organizing teams, working with our endorsed and allied electeds to move forward critical legislation, and coordinating local resistance to Trump’s national attacks on immigrants, refugees, our healthcare, and the very integrity of our democratic institutions. Engaging in a thorough and transparent endorsement process to run our members for office and support our allies, impacting elections in 2018 from selectboards on up to the governor’s race. Candidate recruitment – Through relationship building and surfacing candidates from existing networks, event organizing and digital outreach. Electing our candidates – By supporting endorsed candidates through digital and social media communications to our membership, training on electoral skills and leadership development, organizing events, and support with strategy, tactics, and volunteer recruitment. Helping our candidates govern – By organizing with candidates in district, running events for constituent education and political analysis, and offering candidates access to resources from our statewide and national networks on legislative research and other information. e research and other information.